The last bit in the article is relevant. What do you do when your far infrared heaters burn out in your sauna and the company is no longer in business? Plus, do you need an electrician to wire it? That's one big advantage of near infrared lamp saunas. You can get suitable lamps online, anywhere without having to deal with a company that's out of business. Also, they are as easy to replace as any electric lightbulb. Unscrew the old one, screw in the new one and you're ready to go in 30 seconds! Check out http://www.drlwilson.com for a simple, no nonsense sauna. 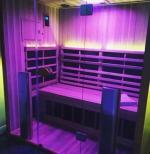 Or http://www.nearinfraredsauna.com for some really great near infrared sauna designs. Join in and write your own page! It's easy to do. How? Simply click here to return to General page contribution.